The Detroit Lions are a 5-8 football team, which certainly doesn’t make them a good football team. It’s already impossible for the Lions to have a winning season as we enter Week 15. This is nothing new for a franchise that has zero Super Bowl appearances and zero division titles since 1993. Granted, the Lions had winning seasons in three of the last four years, and were expected to be competitive this year. Last season, the Lions found themselves one game out of the playoffs despite a winning record at 9-7. They had that same record in 2016, but were fortunate to get the No. 6 seed via tiebreaker with the Tampa Bay Buccaneers. 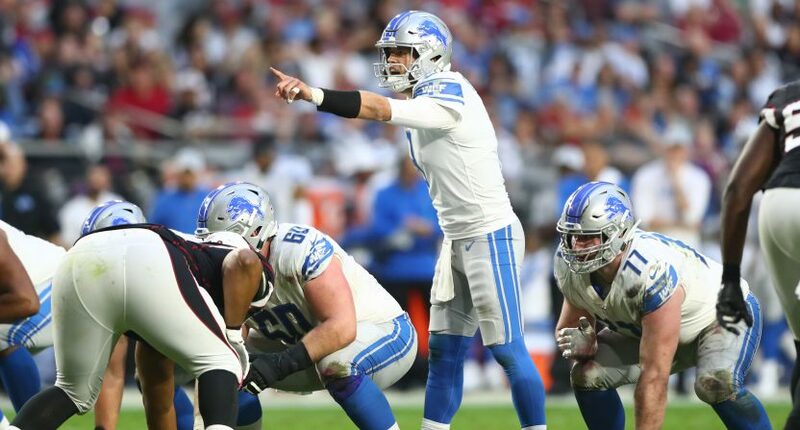 This season, Detroit found themselves 3-6 after Week 10, 4-7 after Week 12, and 4-8 after Week 13 in year one of the Matt Patricia era. As 2016 and 2017 showed, sometimes you need 10+ wins to secure a playoff berth, and most seasons you need at least nine wins. So, the Lions’ season was seemingly over after Week 10, especially after Week 12, and *especially* after Week 13. But incredibly, they still have a not-too-crazy path to the playoffs. That’s because the teams outside the top five in the NFC have also been bad, especially of late. The Minnesota Vikings currently would have the sixth and final playoff spot, with a record of 6-6-1. The Vikings have lost three of their last four games and now have a negative point differential (-9). Minnesota is followed by three 6-7 teams in the Carolina Panthers, Philadelphia Eagles, and Washington Redskins. The Panthers have had a stunning freefall, with five straight losses after a 6-2 start. The defending champion Eagles have shown no signs of being anything more than mediocre this season, and they have to play the 11-2 Rams this week in Los Angeles. And the Redskins have lost four straight games and are down to their fourth-string quarterback. The Green Bay Packers are still hanging in there at 5-7-1, but they have to play at the 9-4 Chicago Bears (who can clinch the NFC North title with a win) this week, and they play the Lions still. And in this Detroit-to-playoffs exercise, we’re assuming the Lions win their games, because they have to! The Giants and Buccaneers are 5-8 as well, but their paths are more difficult. Five Thirty Eight gives the Giants and Bucs each a sub-1% playoff chance at the moment. As for the Lions? Five Thirty Eight has those chances at 3%, but the computers also aren’t taking into account just how terribly things are going for the teams Detroit is chasing. For example, Washington has a 10% chance, but do you see Josh Johnson actually leading them to at least two wins? I just gave the Lions three wins, and the odds immediately went up to 28% (while only adding a loss for the Packers and Vikings). So, it’s very unlikely, but it’s doable, and that honestly shocked me as I played around with ESPN’s addicting NFL Playoff Machine. This goes without saying. And even if the Lions win every game, they’re still probably left out. But there’s certainly a chance eight wins gets it done, seeing as how winning two+ games will be difficult for all of these other playoff-chasers right now. The Bills game is the easiest of the three on the surface, and the Lions are still a 2.5-point underdog at the moment. But Detroit is probably the better team, and Five Thirty Eight actually has the Lions as a 0.5-point favorite. This will be a tough game on the road, but it’s basically a coin flip. The Vikings game looks more winnable each week, and if the Lions’ playoff hopes are still alive, the crowd at Ford Field should make it a tough atmosphere for Minnesota. Five Thirty Eight has the Vikings as a 0.5-point favorite right now, which would say this is another borderline coin flip. Then there’s the season finale against the Packers at Lambeau Field. If the Packers (a 5.5-point underdog) lose to the Bears this week, they’re done (even if not officially). And if the Packers are indeed eliminated going into Week 17, it’s easy to see them not going all-out for that game. At the moment, Five Thirty Eight has the Packers as a 2.5-point favorite. So, the Lions may be underdogs in all three games (and it’s easy to see them losing out), but these are absolutely all winnable games at the same time. In this exercise, we’re assuming the Lions win out, so we’re giving them a win over the Vikings. That puts the Vikings at 6-7-1, so one more loss and they can’t get to eight wins. The Vikings host the Dolphins this week, and are 8-point favorites. That’s a pretty eye-opening number, considering that the Dolphins *have a better record through 14 weeks* than the Vikings do, and just beat the New England Patriots on Sunday. The 9-4 Bears have already beaten the Vikings this season, and even if Week 17 doesn’t matter for Chicago’s own seeding purposes, the Bears may want to keep the Vikings out rather than possibly face each other for a second straight week in the Wild Card Round. And especially if this means the Bears getting to face the Lions instead, a team Chicago has beaten twice (and pummeled at Soldier Field). The 11-2 Rams are angry after their Sunday night loss to the Chicago Bears, and are still chasing the No. 1 seed. They’re nine-point favorites in this home game. The Lions beat the Panthers this season, so Detroit has the head-to-head tiebreaker. The Panthers still play the 11-2 Saints twice, and again, they have a five-game losing streak. The Panthers winning out seems far less likely than the Lions winning out. The Redskins would also need to lose two games, but it’s hard to see that not happening with their quarterback situation. And the Buccaneers would need to lose at least once, but with games at the Baltimore Ravens and Dallas Cowboys, that’s quite likely. So there you have it! Obviously several things need to happen, and the Lions will have a difficult enough time winning each of their games. But there’s nothing specifically in this playoff path that seems all that nutty on the surface. Now, odds are that something quickly goes south here (like, the Lions losing to the Bills?). But entering Week 15, the 5-8 Lions truly have a semi-realistic playoff path. Somehow.